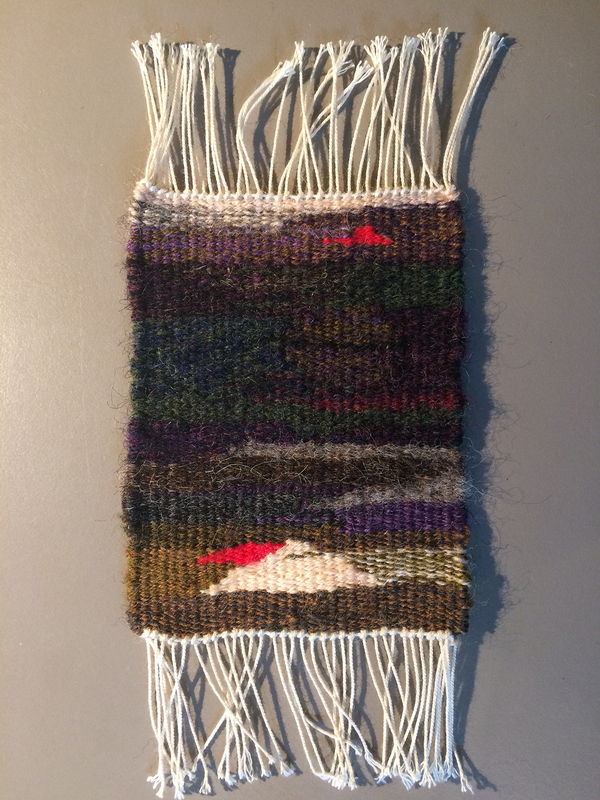 Finally finished my second tapestry from the Rebecca Mezoff Colorado Workshop. We were working inspiration from our mountain experiences and I had fallen at (I later discovered) “Old Gulch Overlook” taking a picture of mountains – teach me to not pay attention to where I was going… and made a one point landing on my cheek. Not pretty! I wore dark glasses most of the time but one can’t weave with dark glasses on…My fellow workshop weavers had the brunt of the fall as they had to look at the dreadful bruise that over took half my face – I didn’t feel it until I would pass a mirror and then…. So this weaving is a thank you to them for making me feel comfortable. It was a wonderful workshop! Beautiful location, terrific new friends, and I learned so much! Thank you Rebecca!